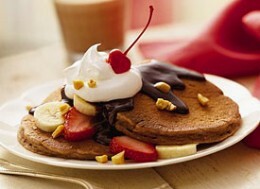 Why not treat yourself or surprise your family by fixing quick and easy gourmet pancakes? You don't need to make them from scratch. I will show you how to make them using bisquick and adding a few simple ingredients. 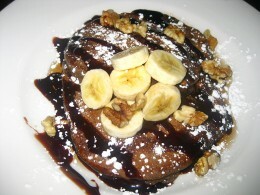 Its no wonder that many people turn to restaurants to get their pancake fix. But what if you could enjoy this breakfast favorite at home in the comfort of your pajamas? Gourmet can be just a little extra time or ingredient that sets your food apart from the everyday flapjack into something special. Bisquick pancakes are probably one of the easiest hot breakfasts to whip up in a hurry for family, friends, or even a big crowd of overnight guests. Like when your kids have a sleepover. All you really need is eggs, milk and Bisquick mix plus butter and syrup. Simply beat all the ingredients together and then pour about a 1/4 cup of the batter onto a sizzling hot greased or nonstick griddle. Cook until the edges begin to dry and they are golden brown on the bottom, then flip and continue cooking until that side is golden brown. There are all kids of variations you can incorporate to delight your taste buds. Of course, kids always love chocolate chip pancakes. And you can use white chocolate chips, peanut butter chips or butterscotch chips as well. Use 1/2 cup in the batter. Blueberries are a great antioxidant rich fruit and they taste delicious in Bisquick pancakes. Just stir in 1 cup of fruit into the batter before cooking. Bananas are rich in potassium. 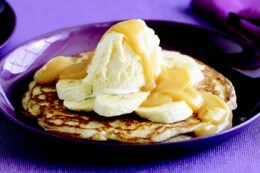 Slice them up and drop slices onto the griddle and then pour the pancake batter over the banana slices and cook. Here is a great idea that I found on the Coffee-mate website. Simple substitute 1 cup of your favorite flavor of liquid coffee-mate for milk in the batter. These are the flavors available which can produce some amazingly creative pancakes. Any type of sliced fruit that you choose. 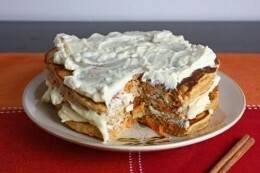 Top with whipped cream or vanilla yogurt. 1. 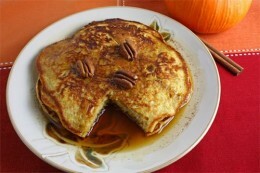 In a large bowl, combine the pancake mix, cinnamon, nutmeg and cloves. In a small bowl, beat eggs and milk; stir into the dry ingredients just until moistened. Stir in carrots. 2. Pour batter by 1/4 cupfuls onto a greased hot griddle. 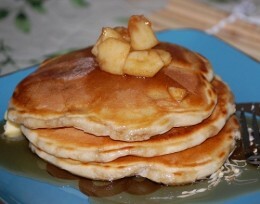 Turn pancakes when bubbles form on top; cook until second side is golden brown. 3. Mix the cream cheese and maple syrup and add some powdered sugar to get it as sweet as you like. 4. Spread the cream cheese onto the pancakes. 1. In medium bowl, stir Bisquick mix, milk, 1/4 cup chocolate-flavor syrup and the egg with wire whisk or fork until blended (batter may be thin). 2. Brush griddle or skillet with vegetable oil or spray with cooking spray; heat griddle to 375°F or heat skillet over medium heat. 3. For each pancake, pour slightly less than 1/4 cup batter onto hot griddle. Cook until edges are dry. Turn; cook other side until golden brown. 4. Serve with remaining ingredients. Place biscuit mix in a large bowl. Combine the eggs, milk, and cinnamon stir into biscuit mix just until moistened. Stir in apple. Pour batter by 1/4 cupfuls onto a greased hot griddle; turn when bubbles form on top. Cook until golden brown. In a small saucepan, combine syrup ingredients over medium heat. Bring to a boil. Reduce heat and simmer, uncovered for 5 minutes or until slightly reduced. Serve with pancakes. Top with apple pie filling. Top with syrup and pecans. 1/2 cup of pumpkin pie filling. 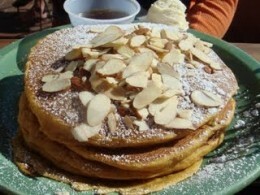 Toppings are powdered sugar and slivered almonds.